Let’s give it up for the Townsend’s Solitaire! Sweet, pudgy thing! I’ve never seen one of those before–do they sing? So glad we’ve migrated to the same place, with regards to CK’s class! I’m wearing the same wide-eyed, whoa-what’s-going-on-here? 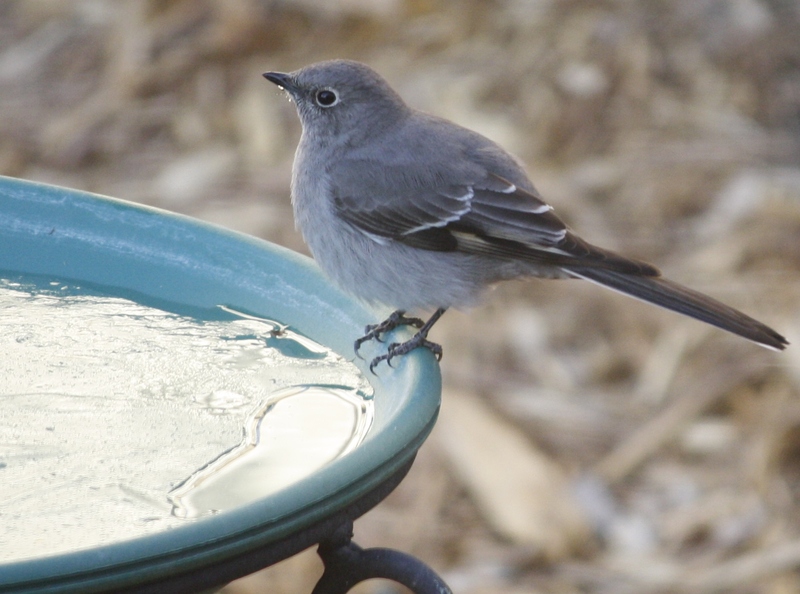 look as the Townsend’s Solitaire, but I’m glad for this opportunity. Learning so much! Funny you should mention the pudgy factor, because that was one characteristic that made me hesitate in the identification. They’re supposed to be longer and leaner looking, but I kept coming back to this ID. I found other pics online and think maybe it’s pudgy here because the feathers are fluffed against the cold. As for the song, I haven’t heard it. I’m right there with you on the wide-eyed, whoa look in CK’s class. I’m working on my letter this morning and then will finish mapping the last two scenes of my draft and then will go back to the discussion board to read the bookmapping thread. I’ve stayed away from that because it was overwhelming me, but now that I’m nailing down the core and points, I feel as if I can look at all that again without running screaming into the wilderness. I am so very happy we’re in the class together! Beautiful! And there must be a lot of love for you in birdland, Tracy, for providing a heated pool.